Looking for an antidote to all the myths and hype? Dietary advice that works in the real world? You’re trying to make good choices about what you eat. But there’s so much nutrition info out there. Some of it is outdated, some is incomplete, and plenty of it is just plain kooky. That’s where I come in: I can help you sort fact from fiction, and sift the good info from the bad. Even better, I can help you separate the important stuff from the stuff that’s just not worth worrying about. Diet trends come and go–and new research rolls out practically every day. Let me help you chart a sane course through the chaos. I don’t get too caught up in the latest fads. There are lots of ways to put together a healthy diet. My job is to help you find the one that’s the best fit for your lifestyle, values, and food preferences. 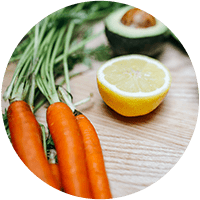 Whether you’re cooking for one or a crowd…or rarely eat at home… whether you’re an athlete or a desk surfer… whether you have a restricted diet or you eat anything…I’ll help you find healthy solutions that work for you. French-fry lovers? You’re welcome here too! I should probably warn you that I’m neither purist nor perfectionist. Sometimes, you may choose to eat something not because it’s good for you but because you love it. Or because someone made it for you. Or because it’s the least of the available evils. I’m living proof of the fact that you don’t have to eat a perfect diet in order to be happy and healthy.